The bus to never ever land!" Last night a legendary apparition materialized in a darkened neighborhood of Madison, WI and proceeded to light up the streets with neon day-glo colors. FURTHUR! is here! That's right....the legendary vessel that carried Ken Kesey and his Intrepid band of Merry Pranksters' across the country has re-appeared. This is the trip that ushered in the Sixties Revolution of art, music, and consciousness. Now the bus has come full circle and is back on the road as part of the Furthur Bus 50th Anniversary Tour. 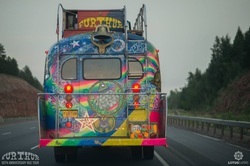 Destination: Furthur! But before that, there is a kick-off party in Madison tonight at The Barrymore Theater featuring The Grasshoppers and The New Speedway Players and a chance to celebrate community, literally from around the world, who have gathered to revel in the energy that birthed The Grateful Dead. Captaining the ship is Ken's son, Zane Kesey, who will direct the bus as it travels through America stopping along the way for parties and music from some of the best up and coming bands on the scene today. Be there or be square. The party starts at outside the Barrymore at 8, doors at 9. Paving the way for spoken word jam, Flowpoetry transcends musical boundaries. Through interlacing shared storytelling and poetic vibration into a communal and collective consciousness, he unifies the ancient and future as one. Flowpoetry (aka Adam Gregory Pergament), is a best of Madison, WI 2014 Spoken Word Poetry award winner and a three-time finalist for Best Artist in the Annual Madison WI Area Music Awards. He has performed over 950 times around the US with jam-bands, electronic music producers, jazz ensembles, bluegrass pickers, and as a solo poet. Flowpoetry will in fact be going Furthur on the bus, experiencing a journey of a lifetime, and joining the tour from Aug 10-18 as it winds it's way through Pennsylvania. Luckily for us, he will be checking in with WIJAM from time to time, with updates, photos and more as he tours around the country on the iconic bus! Follow us on Facebook and Twitter to see the latest updates from the road, as they come in! You can also check back here for updates, as we post them below!!! To the front or the back weave whispers of delight. Striking sunlight up under the setting sun glow." Imagine three city blocks of unsuspecting people enjoying a summer Saturday street festival, strolling and listening to a band cranking out 1970's disco, and just as the musicians bust into Sly and The Family Stone's "I Wanna Take You Higher", the Furthur Bus 50th Anniversary Tour bus slowly rolls into view. That's how the Madison, WI bus stop started and it was a glorious scene! Inside the theater was festooned with tie-dyes and bedecked with dancing faces and smiles. Both The Grasshoppers and The New Speeway Players sounded amazing and I performed a solo Flowpoetry set as well. Throughout the night pranksters new and old became friends and a a loosely knit network of those traveling along with the bus has begun to grow. It's a beautiful trip for sure and how it will all wind up is impossible to say. There are a myriad of energies and realities emanating from and surrounding the vehicle itself and everyone who enters into its atmosphere is effected. Planning and logistics are impossible and the only surety is that when the large bell affixed to the upper deck of the bus rings, then it is time to go. So, after a morning of grinding and welding, the bell was finally rung and the Furthur bus left Madison towards Michigan and points East with other buses, vehicles, and pranksters in tow. I'll remain in Madison, WI for two weeks fulfilling Flowpoetry WI festie and show obligations and then jump back aboard on Aug 10 for a week long run through Pennsylvania. Look for furthur updates as that approaches. For now keep love in your heart and a sense of adventure in your soul. Here is I sit bags packed and ready to go. The plan is simple, first a stop a People Brothers Band People Fest 2014 to do a campfire set of Flowpoetry at midnight and then directly into GW's van and an 11 hour ride East into the rising sun to catch up with the Furthur Bus. Should be a snap except for the fact that the bus has a schedule that seems to waver like a mirage and flex at the strangest of times (Never Trust A Prankster!) and all I know for sure is that when the bell on the top of the bus rings, it is time to go. GW and I are hoping to catch them somewhere between Ohio (they've been at The Werk's Werkout Festival) and Pittsburgh on Sunday (that's tomorrow!). I'm scheduled to read poetry at the Pittsburgh event and if the bus materializes, I'll jump on for the ride. If it doesn't then we're off to Bedford, PA and Wills Mountain where the certainty of it appearing seems more assured. After an 11 hour drive, having longingly left behind the smiles of People Brothers Fest in Hillsboro, WI, we arrived in Pittsburgh to an expectant host of East Coast heads and freaks. A quick half-step back to 2 am Saturday night after my Campground Flowpoetry set in WI....GW, who was originally supposed to make the trip with me, was unable to get his van on the road due to the mixture of a downturn in the rock and gem business (i.e, he had no funds for gas) and an upturn in the availability of pain-killers (legit as he had really messed up his finger in a mad leap from the top of his van at a festie 2 weeks prior). As I have learned throughout my travels, a little faith goes a long way, and so after my set, I mentioned that I was looking for a rider for a week East on the Furthur Tour. OS promptly volunteered, packed up his tent, and we were off. Plan B, never a plan at all but always a possibility, manifested and realized. 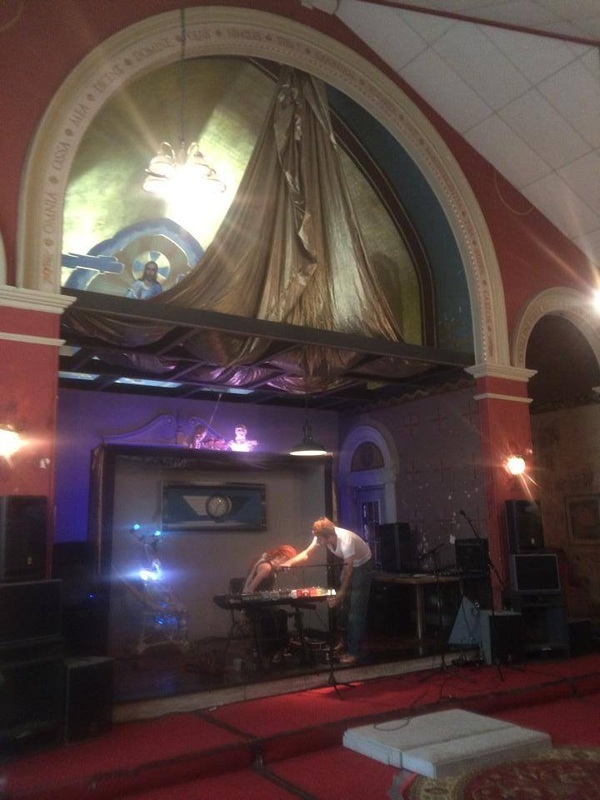 The tour stop in Pittsburgh took place last night at a run down church now turned into an art space called The New Bohemian. The gathering included a bunch of talented bands that played everything from punk to power pop to folk and more. Incredible acoustics and a perfectly crumbling space that had religious images and stained glass all around. Fire spinners, smiles all around, and a good time for a Sunday night by one of Pittsburgh's three rivers. I performed a tweener set of Flowpoetry between the final two bands, OS took a piss in what he claims to be the most beautiful alley he's ever seen and we headed out. Next stop Wills Mountain in Bedford, PA for music, mayhem and a special, late-night screening of Ken Kesey's long-awaited film, “Magic Trip,” documenting Futhur’s now historic, 1964 cross- country adventure. Lost loaded on a river of steam. Morning in Bedford PA and turkeys (vutures not quite sure) on the stage. All of the gear is out of the bus for an inventory and Zane turned ship-chandler. Wills Mountain is beautiful with great sound and the nicest folk. Been on the land for 7 generations and threw down fresh goats milk for morning coffee. Another round of groovy bands including Adam' Ale and Spongecake and the Fluff Ramblers then a late night circle of music and poetry. Pouring rain sizzling all night and slept under a huge banquet tent the venue kindly left up for us to camp under. Lotus Eaters Films camera crew is everywhere and the Furthur Bus 50th Anniversary Tour (un)reality show rolls on. Next stop is White Haven PA. ....(un)reality show rolls on. Next stop is White Haven PA.
Sandy Valley soaked in rain and smiles. Stream of consciousness: sam cutler's accent and beautiful calm energy introducing the poetry portion of the evening reading with big brother who was out loud for the first time in his life birthday air guitar milton under the pool table Telesma dr slothclaw corn fritters singalongs and swings. Sandy Valley was small but very kind and we all piled into a cabin to sleep after raging the rec room until almost dawn with a string band. Riding on the Furthur Bus 50th Anniversary Tour is a joy and I have to keep snapping myself back to the fact that this trip is happening and such an amazing piece of American history is floating me down the road. As he drives, above Zane's head in the middle of exactly 11 rearview mirrors is a photo of his father Ken and an ink sketch of Neal Cassady watching over it all. The sun is finally out and we're off to mountain sky and then a day off for Prankster play time on Thursday. Wish you all were here! Rolling on the bus out of Mountain Sky and the Pennsylvania hills are awash in sweet ripe blueberries. We ride in a day-glo cocoon spun through with the threads of more hopes and dreams than imagination can account for. Last night was a most Wonderful Wednesday with a whole family of freaks dancin and singin in the stars. Parties on mountain tops are always influenced by the rarity of the air. Just stating a fact. Zane gave us a moment many of us had been waiting for by striding up onto the hood of the bus with light sabre in hand as the band blasted into The Other One. A full circle moment and we all danced together until 3 am. Blissful. If you ever hear of festivals up at Mountain Sky go and say hi. The community up there is filled with kindness and heart. They have stood their ground and are doing it right. So hard to find in today's world. Another statement of fact. Now on to a drop off drive by and then onto Bethel NY, Yasgur's Farm and a Woodstock celebration. Zane Kesey with light sabre as the band plays "The Other One"
Today was a travel day. 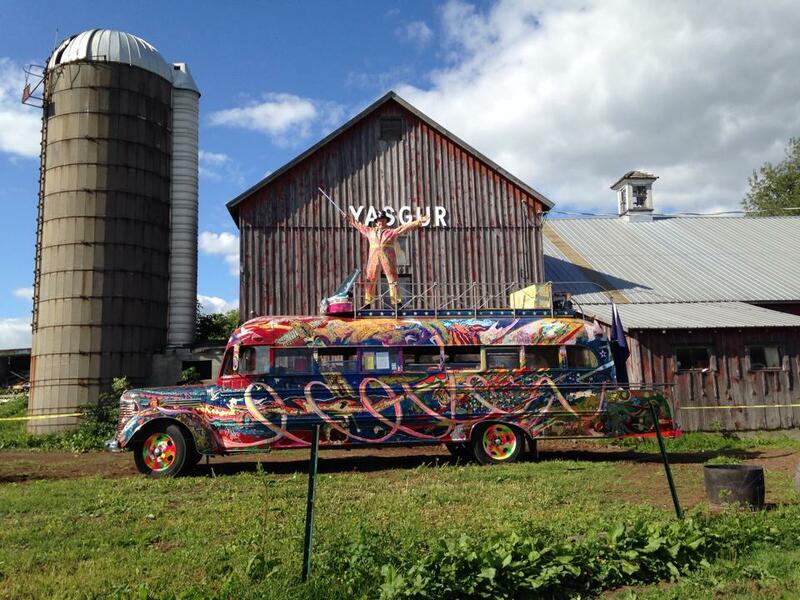 Rolled the bus to Yasgur's Farm and the land on which the Woodstock Festival was held. It's the 45th Anniversary of the 1969 event and there will be music all weekend. We stopped to wash the bus and then onto Hippie Thanksgiving in Bethel New York. About 300 folks of all ages cooking together and breaking bread. The whole vibe was very warm and welcoming with hugs and "Welcome Home"! 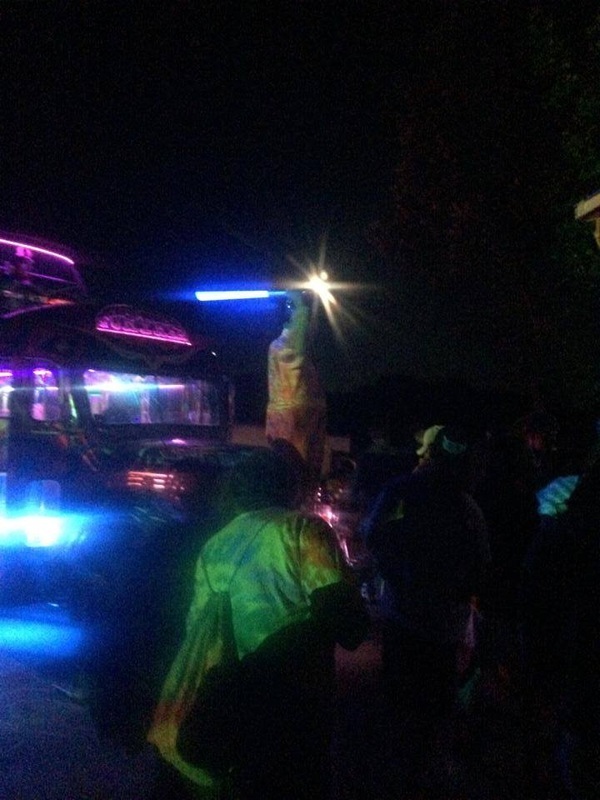 The reception for the Furthur Bus 50th Anniversary Tour and all of us Pranksters continues to amaze with how much it means to the people we meet. For so many the bus and the Pranksters represents the origin of it all and when they see us roll in they are legitimately moved. Pranksters are necessary and while the much of the world has seemingly moved on, the messages of peaceful change through music, poetry, creativity, and radical self-expression live on. Day 2 at The Yasgur Road Reunion for The 45th Anniversary of Woodstock brought a trip to the monument overlooking the large grassy bowl where the festival occurred. It exists in its glory 5 minutes down the road from where Furthur Bus 50th Anniversary Tour is parked. I had the honor of riding shotgun and navigating the bus back to the original site. Zane wheeled behind the stage and dropped off a load of Pranksters. We were there to sit in the grass and watch the Woodstock movie as it blasted over the hill. Nostalgia notwithstanding, it was a very powerful moment to share with the assembled crowd. As the same notes of music that had danced over 400,000 freaks 45 years ago played again, we listened and watched the moonrise over the site and basked in the glow of a huge sparkling peace sign. We're here for 2 more daze of music and camping and then I turn for home. I hope you all are having a beautifully weird weekend and thanks for following along with me on the bus! 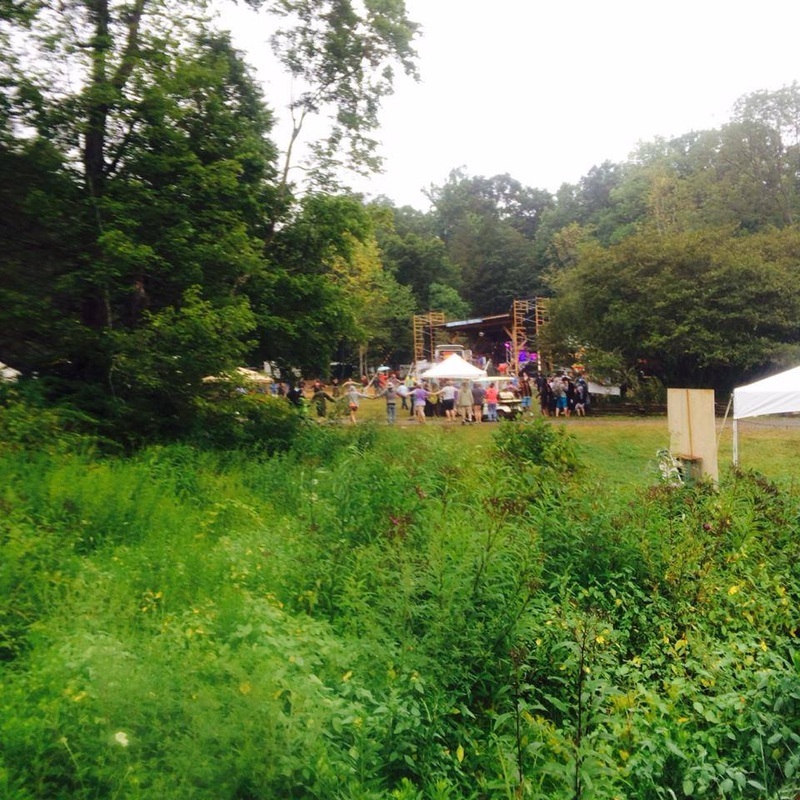 Day 3 on Yasgur's Farm was a beach party and picnic. After a night wandering through the day-glo woods listening to bands us Pranksters chilled, swapped stories and welcomed the new crew of riders who started streaming jn. No one knows where the bus is headed as the schedule keeps shifting in the wind like heat rising off a highway. Derek and Zane will wander off for a while and then come back with updates that we all simply nod to and say cool. Highlights of the afternoon included conversations with old timers who had been at the original gathering 45 years ago, watching Bill Hanley get interviewed on the back if the bus (http://woodstockpreservation.org/Gallery/BillHanley/BillHanley.htm), and a ride on Furthur Bus 50th Anniversary Tour to the Bethel Woods Museum where we all wandered through the exhibits, watched documentaries, and sat in a replica of the bus. A bit of a through the looking glass wobble, as after sitting in the replica we climbed back on the real deal. Dig? Tomorrow is my last day traveling with the crew. What a long strange trip it's been. Sunday at Woodstock was super chill and a chance to hang and soak in the Furthur Bus 50th Anniversary Tour vibes. We celebrated a Prankster birthday, I shared some poetry, and then took the bus across the farm for a picture in front of Yasgur's barn. Late night was a sing-a-long at the drum circle campfire and a fluorescent black light walk through the woods. Tomorrow the bus rolls East to Baltimore and I roll West to Madison and an up-coming late night Flowpoetry show at IfdaKamp. I'll have some wrap up thoughts tomorrow from the road West. Til then wishing you all a peaceful evening and happy trails.